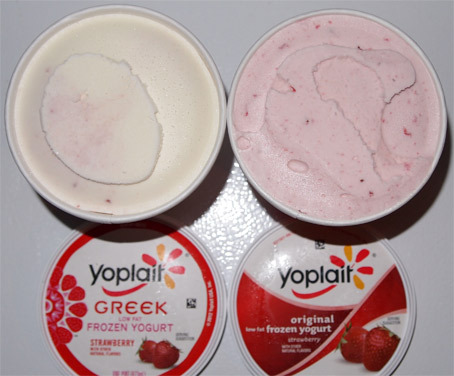 On Second Scoop: Ice Cream Reviews: Saturday Night Showdown with the new kid on the freezer block - Yoplait! Saturday Night Showdown with the new kid on the freezer block - Yoplait! [Discontinued] Good evening ladies and gentlemen. 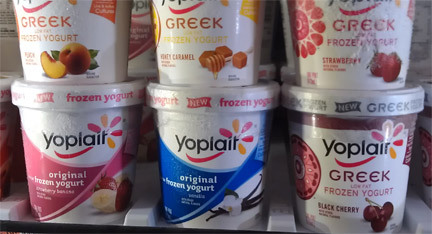 If you have been following our facebook feed then you know that I discovered a new contender in the frozen yogurt scene, and his name is Yoplait. They've jumped on the frozen yogurt bandwagon in a big way, but rather than putting the new kid up against an experienced challenger, we're going to make him battle himself first. You see, Yoplait has come out swinging hard. Oh sure, TCBY broke out before summer with their introduction into the freezer aisle, but this didn't really shock me as much as this did because they are boldly attacking both the froyo and Greek froyo trend at the same time. I don't think anyone else has tried that yet, at least not in my neck of the woods. Regular Froyo Bars in Harvest Peach and Strawberry Banana. Greek Froyo Bars in Honey Caramel and Raspberry. That's a pretty impressive lineup if you ask me. There's nothing funny either like chocolate or cookie dough, these are all very much Yoplait's standard flavors just in frozen form (yes, Yoplait does play around a bit with their light flavors, but I'm not seeing that here in the frozen section). Oh yeah, notice that these are 16oz PINTS, not 14oz faux pints, so you get four full servings --- hahahaha, they are made by Blue Bunny! very cool. Let's see what our friends from Iowa have in store for us. Update #1: Marvo found a small homepage for these new flavors. Update #2: 10/3/12 - Nick noticed the real homepage is up now. Alrightly, time to take a good look at how they are marketing the two varieties of froyo. 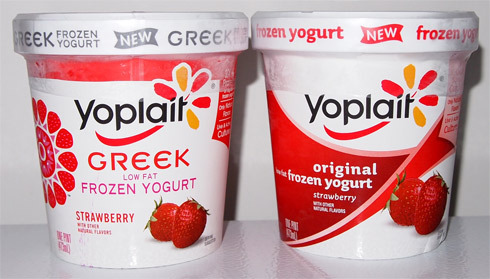 The original looks basically identical to their current lowfat yogurt offerings while the greek one adds the playful artwork style from their greek yogurt offerings. Makes sense and all, and both are catchy, though deep down I like the original better. Original vs Greek: appearance tied. Let's take a quick peek at stats. Greek adds a half gram of saturated fat, which adds 20 calories (I think they messed up the "calories from fat" marking. The expected thing here is the doubling of the protein in the greek variety, but somehow that translated into a loss of the fiber content. The point is these are both good for you and should cure your frozen fix with minimal guilt, but if you have to pick one, the greek variety packs the most nutritional punch. Greek wins the nutrition battle. Ok, I wasn't expecting that at all. I mean, the original froyo looks as expected, but there is almost no coloring in the greek version. There's also almost no smell from the greek version while the original smells wonderful. Wow, what amazingly different presentations. I know which one I want to try first! Original wins the best first impression. I take my first bite of the original and it doesn't taste nearly as strong as it smells. There is definitely a bit of a yogurt taste, but not tangy yogurt. I really expected the flavor to be stronger like their regular yogurt. It's a bit icy/non-creamy, but it's also somewhat airy and not dense so we are doing ok overall. Actually, now that I think about it, I guess it is vaguely reminiscent of Blue Bunny's naturally froyo line, but definitely not identical. As you can see, the strawberry bits vary greatly in size from tiny to mid-sized. Ok, let me try some of the bigger strawberry bits - Hmmm, still not adding the berry burst I expected (or hoped for). 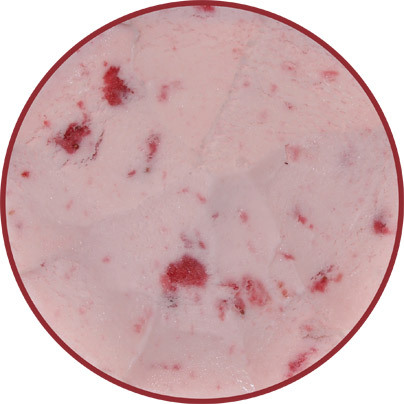 I love to take a break with strawberry flavors but this one isn't taking me out to the countryside, it's just showing me a picture of it. HAHAHAHA, now that's a tough froyo - it holding up it's own spoon! Oh yeah, that's a weird first impression! It's almost got the consistency of very chilled cannoli filling, plus there is no strawberry flavor to boot. Let me try another scoop. I'm not getting nailed by a tang, but wow, talk about a wacky texture. It's almost frozen butter like? There is very little air in this one... oh, wait, did i just get some tang, yeah, a bit. I was aiming for the strawberry swirl and apparently I missed. As the Greek sits out, the texture does get a bit more normal. As the regular sits out (for too long), it becomes very soft. The original vs Greek thing is not a gimmick here to drive sales. These products are very different. I'm shocked really at how dissimilar they are. If you disguised the pints, not in a million years would I think these two buggers were sharing a freezer shelf together. Now I'm not saying this is a bad marketing strategy, it's just really weird experiencing first hand. So I definitely wasn't expecting that. 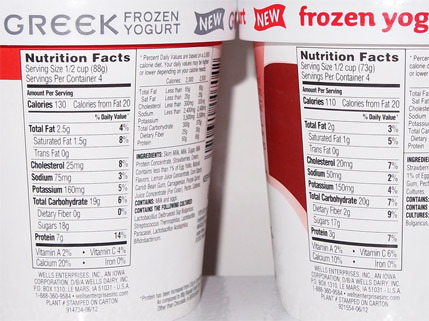 I mean, part of me was since Greek yogurt tends to be thicker, but trying to compare those two side by side is alot of froyo for one blogger. I'm literally on froyo overload .... yeah, I just washed those two down with a big handful of pretzels. So who's our showdown winner? The Original ofcourse. It's lighter fare but it makes me want to try all the other original flavors in hopes of finding the perfect one. The Greek? Well, its funky and healthy enough that I will try another pint at some point over the next few months, but it'll be a calculated decision before I do, it won't be a free for all of just buying all the pints. Alright, have a good night, and thanks to Nick for the "Saturday Showdown" moniker, without it, I would have been up 'til midnight trying to get this fight posted. what supermarket did you find these at? I have heard great things about the Greek lines plain vanilla and definitely want to pick it up. havent seen in my supermarkets yet though (and i know we share a similar selection of them). ahh, sorry man, I found it at the only place I reliably find blue bunny products: WALMART. Sometimes I see BB stuff at Shaws, so I'll look there too in the near future. Mitch, I believe the shop rite in Albany is starting to carry these. I'm not 100% sure on what they'll be stocking but I stopped in there not too long ago and they had a couple of the bars there. Im back at school now. Down state a bit...we do have a shoprite but they have yet to stock this (was there yesterday). This one is so run down though and the ice cream selection is lacking. The one in Albany is like polar opposite of this place...speaking of which, the Albany shoprite has the most extensive variety of ice cream Ive ever seen plus they seem to have 1-2 brands on sale for great prices weekly. I agree, when I first went there I was just staring at the ice cream selection and was a bit overwhelmed at first. There was a few brands I didn't even knew existed until I went there. 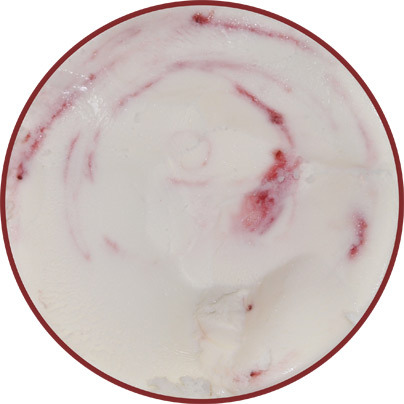 The best flavor, or one of the best flavors, of frozen yogurt is Stonyfield's "Gotta Have Java". I'm not a coffee drinker but I have purchased a pint of this flavor about 8 times in a month. It has no tang and doesn't taste like yogurt. It has the creaminess of soft-serve and is very sweet and delicious. I highly suggest you try it, and as always, would love to hear if you feel the same way. I have bought this more than any other ice cream flavor in my life, even more than any of Ben and Jerry's flavors, who I think makes the best ice cream. I have had this flavor before and from what I remember, I did like it. I'll have to revisit it sometime soon to see if I still feel the same way about it and give it a proper review. The Greek froyo comes out of the freezer HARD AS A ROCK. 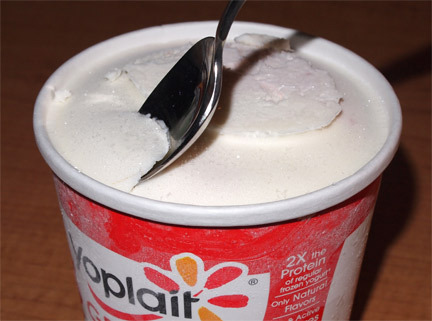 You can't get a spoon to make a dent. No instant gratification here for sure. I guess I will try the regular next.....hope it isn't the same!